**WARNING**: You are about to drive into a telephone pole! You can’t see where you’re driving because of that bag over your head. Huh? What is he talking about? Well surprise, surprise, this is effectively the situation with your website if you haven’t taken Analytics seriously. 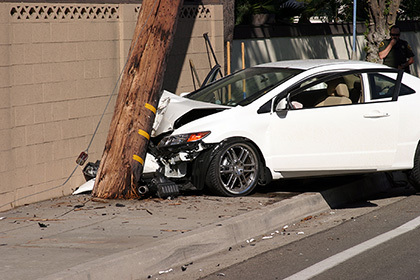 Analytics can help you make sure not to crash into that pole. Website analytics is a collection of tools and methodologies that, when properly applied, can vastly improve the performance of a site. Said another way, Web analytics is like the report card you received when you were in school. Why did you get a report card? It was to show you how you’ve done and where you need to improve. That is what analytics is to your website, its report card. The main difference between the two is the time involved in the reporting period. Your school report card was for the last semester, whereas the analytics report can be seen as it happens! When we said that it helps with performance, we mean that whether your metric for success is more sales, telephone leads, site visitors, downloads of a white-paper or something else, you need to be able to measure how effective you are and where there is room to improve, and you can do this using web analytics. Websites, by their very nature, lend themselves to being measured. Folks in the print or television media world would kill to have anything approaching the measurability of the web. We have the ability to follow, in real time, what is happening on our sites. It’s funny that so many sites don’t take advantage of this fact. In reality, most websites don’t leverage analytics. Of course there is often some sort of analytics installed, but if nothing is done with the information that is collected, or the proper view of the data isn’t being used, then it is time, bandwidth and energy (read money) wasted. If you’re not measuring how your visitors are using the site, then improving the site isn’t possible (unless you’re a really good guesser). If you want to see how many people visited your site and nothing more, then there are many simpler tools to view those numbers. Web analytics is about giving you actionable information that allows you to improve your user’s experience. With the web increasing in importance every day, it makes sense that you take your own site more seriously and start to get some return on your investment.